Ayn Rand was, by her own choice, a very polarizing figure. To the dying breed of true fiscal conservatives, she was a goddess. To the left-wing faithful, she was evil incarnate. To the libertarian, her voice is both heroic and problematic. Rand was deeply paradoxical in ways that undermined her obvious brilliance. She championed absolute reason but brooked no debate of her ideas from her acolytes. She was her century's most ardent and articulate champion of capitalism, yet was also a supporter of the national military (an institution entirely Communist in structure). She formed an entire philosophy centered on individual expression and aggrandizement, yet would not tolerate that anyone would outshine herself. Escaping from Soviet Russia in her youth, she dedicated her life to combating the totalitarian system she left, only to create around herself another society in which she ruled as the sole, unquestioned authority. As usual, astrology gives us some insight into this most fascinating and important personality. The disposition of Venus and the Second House and their rulers in political astrology tell us about the placement of the native on the scale of economic ideology, from free-market capitalism to complete communal ownership. Neptune and the South Node on these factors move the chart to the economic Left. When the North Node is involved, there is a pull towards capitalism. This is true even in hard-authoritarian charts (William Kristol and Deng Xiaoping, both authoritarians, could not help but push free-market reforms). Some element of Rand's psyche may have been drawn towards non-capitalist perception of value: she had Neptune widely square Venus. This is strongly overridden, however, by the North Node in the Second House, sesquiquadrate Jupiter, co-ruler of Venus. Venus, at the anoretic degree of Pisces, is at the top of the chart, higher than everything else. Rand was nothing if not a capitalist-- religiously so. Rand was not an astrologer, but we can be sure by reading Atlas Shrugged and her other writings that she deeply hated Neptune. She despised mysticism in all forms, hated the Left with a passion, railed against any compromise of the egoic personality, and dedicated her life to a battle against all vagueness of expression. Anti-mystics (usually militant atheists) often have both the South Node and Saturn in relationship to Neptune: Rand has Saturn sesquiquadrate Neptune and the South Node trine Neptune. In addition, Uranus the other co-ruler of Rand's Aquarius Sun, is opposite Neptune. That her entire writing career could be seen as an obsessive war against the planetary lord of the deep might appear as Rand's Mercury quindecile with Neptune. Pallas is a crucial factor in the politics of any astrological chart. In Rand's chart, the astrological goddess of libertarianism and ethics is central. 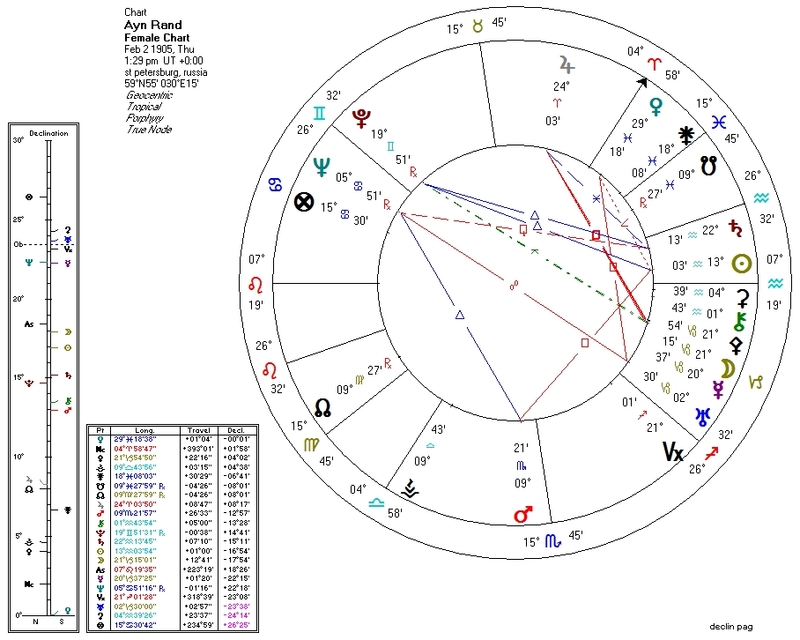 Rand's Pallas is tightly conjunct Mercury, which is the single most powerful libertarian factor that can appear on a chart. This aspect immediately explains Rand's libertarian-esque leanings, her creation of a system of ethics, and her debating skill. Almost equally strong, however, are Jupiter square Pallas, Pluto quincunx Pallas, and Pluto trine Saturn (ruler of Pallas). Without Mercury in the mix, Rand's becomes an extreme hard-authoritarian chart. The entire, self-conflicted gestalt explains why Rand was simultaneously a great champion of libertarianism and its sworn enemy. Matt SavinarNovember 4, 2013 at 11:04 PM Where do you think her addiction to speed shows up? Maybe SN in the 8th, ruled by Neptune in the 12th? http://www.newyorker.com/humor/2013/07/29/130729sh_shouts_hodgman?currentPage=1 I also can't help but wonder if her militant glamourization of capitalism and self-interest was, ironically, rather Neptunian. ReplyDelete Replies astrolibertarianNovember 4, 2013 at 11:39 PM She does have a strong Neptune, which aspects quite a bit of her chart. That may explain a lot of things about her character, from her hyper-romanticism and messiah complex to the delusion and the drugs. She doesn't seem to have been very aware of her self-contradictory nature: a Neptunian soul waging war against Neptune as well as a hater of libertarians who nevertheless inspired many to become libertarians.